Here at EveryDog, we pride ourselves on working with apprentices and helping young people start a career in Animal Care. We offer a fun, relaxed working environment which means young, passionate people can earn whilst gaining experience, knowledge and a qualification in Animal Care. 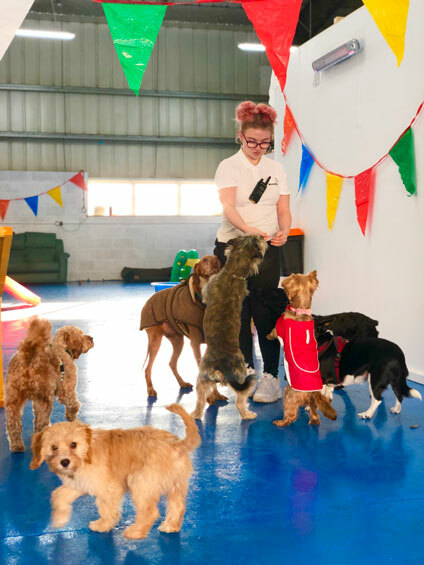 With our excellent support and training by qualified industry professionals, we work closely with our apprentices to ensure they get the best out of the experience and develop a wide range of fantastic skills (such as dog handling, dog behavioural knowledge, retail experience and much more!). Ensuring a close relationship with our apprentices, with lots of support, promises a better future for animal care in this country. An exciting opportunity to work in Kent’s first Dog Crèche. As a versatile Pack Leader you will entertain and stimulate dogs whilst they exercise, keep fit and learn better social skills. You will also be responsible for maintaining a safe environment of all dogs in our care. EveryDog is Kent’s first dog crèche of it’s kind and we are now recruiting for new apprentices to join our rapidly expanding team. We can accommodate candidates on either a Level 2 or 3 Animal Management and Care. We are looking for people with a natural love for dogs. You must be a committed team player, with bags of enthusiasm, able to listen carefully and follow instructions. We will ensure you are offered the opportunity to experience all aspects of a busy dog crèche. This will include day care, grooming, photography studio, training as well as the opportunity to offer feedback and advice to our clients. We are offering a minimum of 30 hours per week. Your assessor will meet with you monthly on site and you will be required to complete assessments at home. Your own transport or the ability to get to Mid Kent Business Park, Snodland, ME6 5UA is an absolute must. We pride ourselves on diversity and like to ensure you have the chance to learn other departments, such as retail, grooming, dog training and photography studio There is an opportunity for continued employment following the apprenticeship. It is important to note that this role isn’t all about cuddling and playing with puppies. Though a great deal of the job is keeping dogs entertained and stimulated, you are also responsible for maintaining a safe and secure environment for all dogs. There are 2 shifts available and you may be expected to work a mixture of both – either a morning (6.30am – 1pm) or a late (12.30pm – 7.30pm). You will be expected to pick up poo, join in with regular cleaning, be prepared to work outside in all weathers and often get dirty. We are looking for genuinely passionate and dedicated additions to the EveryDog family. Full training for the apprenticeship to be given by the employer and KEITS Training Services working towards your NVQ. We are always on the lookout for new superstars to join our team, so please check back again soon for more apprentice opportunities. We are always on the lookout for enthusiastic new recruits to join us here at EveryDog, so apply using the form below (including a 200 word explanation of why you are a pawfect fit for us) and, who knows, maybe you’ll be earning while you’re learning too!